A new EP, Up In Smoke, will be out on August 12th. 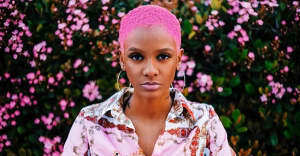 Haters are gonna hate, but Tiara Thomas won't let that stop her shine. In the video for "On Me," premiering today on The FADER, the velvety-voiced singer-songwriter is in full hater-blocker mode. You can't throw your shade on me/ You can't put a label on me/ You can't put a stain on me, she sings over a creeping beat produced by Ryan Ryghteous Tedder. The video is appropriately epic, with Tiara moving coolly in a shifting set of golden gilded picture frames, smoking in silhouette, and chilling in the bright-blue water of a bathtub. Can't a hater touch her. Watch the video above and stay tuned for some new-new from Tiara—she's officially announcing that a new project, an EP titled Up In Smoke, will drop on August 12th.